Dave Salmanson, over at his blog, has just written a post serving notice to Sam Wineburg and the Stanford History Education Group about their omission of recent historiography in many of their historical thinking activities, particularly their most recent one about Columbus Day. I’ve used (and extensively adapted) materials from Wineburg and SHEG over the years and like the ways that many of their “Reading Like a Historian” lesson plans emphasize the conflicting narratives of the past, thereby pushing the student to act as the historian and give shape to the messy reality of the past. Many of these lesson plans subtly push students to prioritize paying attention to a source’s attribution and then keeping those external details in mind as they then make sense of the source and understand its content in relation to its author, audience, historical context, etc. These lessons also push students to synthesize multiple sources and integrate those into an argument, so I’m all for the historical thinking skills underlying these lesson plans. Wineburg deals with a lot of these concepts and how to foster them in his book, Historical Thinking and Other Unnatural Acts, which I’ve read and enjoyed. SHEG also has another project called “Beyond the Bubble,” which offers shorter assessments focused on analyzing one primary source and addressing some question about its sourcing. SHEG calls these activities “Historical Assessments of Thinking,” or HATs for short — therein lies the title of this post. For me, these are less substantive activities, not only because they only address one source, but also because they often lack substantive attributions that would, for example, allow a teacher to foster a class discussion about authorial background and its influence, or consider the role of print publications over the course of the nineteenth century. As a result, I’ve used infrequently and rarely check the site to see what new materials they’ve posted. 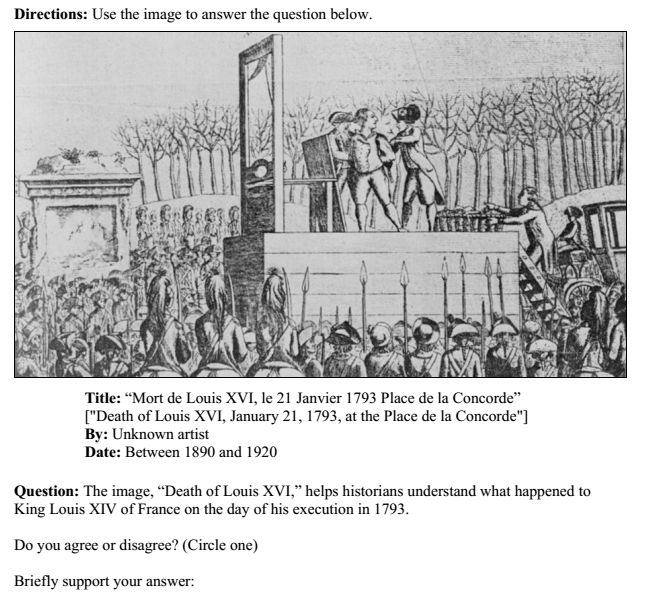 So after reading Dave’s post tonight, I was reminded of an incident last year where I sought to adapt a HAT about the execution of Louis XVI for my Western Civilization classes and gained some insight into the sloppy and (ironically) poorly sourced lesson plan material that actually made meaningful historical analysis less possible as a result of the assignment’s structure. So, not to ruin the surprise or anything, but the HAT wants students to focus on the chronological gap between the event presented by the image and the date of publication. Ideally, this prompt pushes students to consider issues of historical context and whether the late-nineteenth to early-twentieth century context of this image shaped the presentation of this event and, if so, in what ways. I was, however, bothered by the fact that this activity had no author listed. So, I decided to do a little digging and see if I could flesh out this attribution to help my students offer a more nuanced analysis of this source. Finding another version of this image proved to be pretty easy. Simply searching for the title took me to the Library of Congress page for this image, which is clearly where SHEG drew its attribution info. While these images seem essentially identical, I quickly noticed that the SHEG version of the image cropped out the original title, caption, and parenthetical reference to its original source. So, it turns out that this image does have an author (or at least a place of publication) — a newspaper called Révolutions de Paris. That piece of information seems like some pretty low-hanging fruit that would have been helpful to include in the HAT’s attribution. 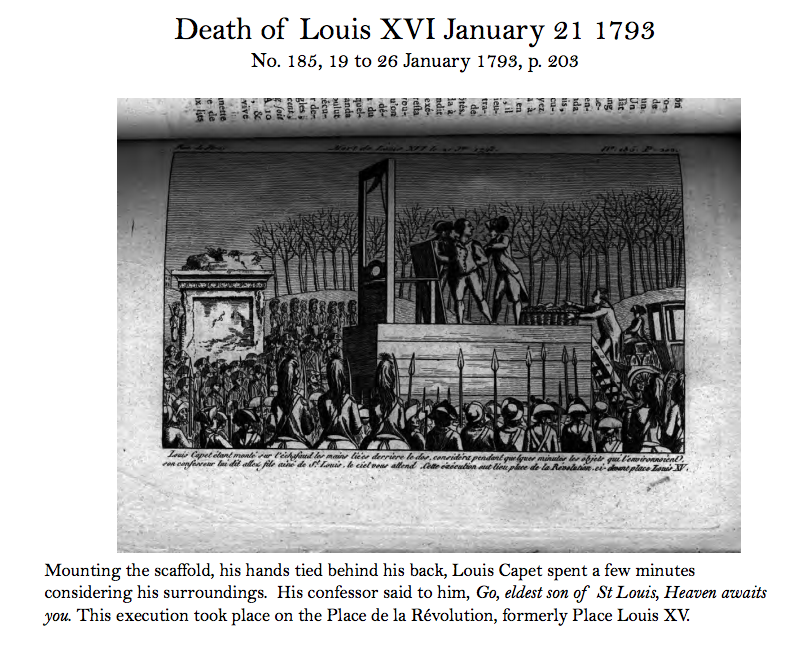 Révolutions de Paris was a weekly newspaper published and edited by Louis-Marie Prudhomme. It began publication July 18, 1789; its final issue is dated 10 ventôse Year 2, i.e., 28 February 1794. This run of over four and a half years, a total of 225 issues, makes it one of the longest running Revolutionary newspapers. Unsurprisingly, discovering the context of this newspaper provides students with much richer material for analyzing this image. 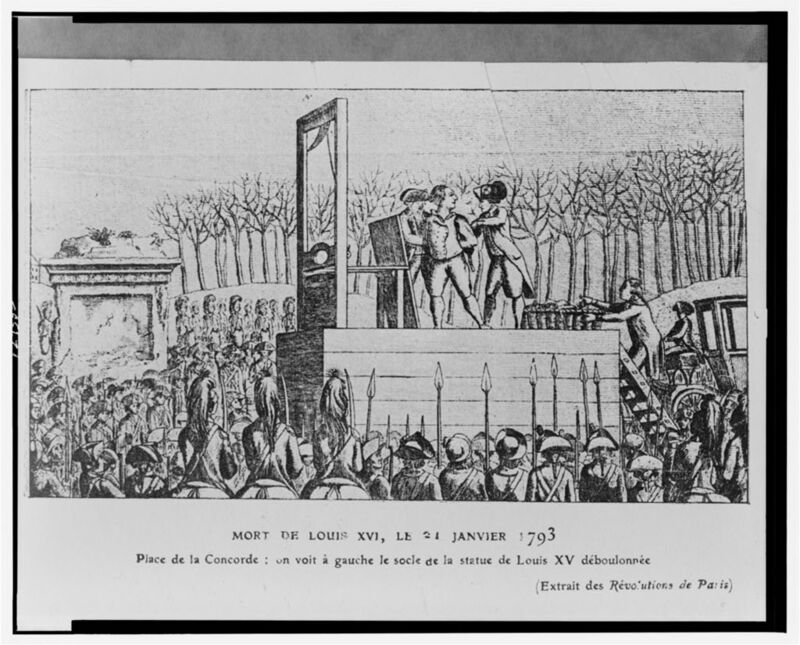 Furthermore, considering (or even including) details about Prudhomme would enable students to grapple with the complex array of conflicts and agendas that shaped the various stages of the French Revolution. It might even be possible to make something of the fact that this image did get republished over one hundred years after its original publication, but that analysis can’t happen meaningfully without the original contextual details. While I still think that many of the SHEG assignments have value in the classroom or as quick assessments, teachers need to be really on guard about how these primary sources get presented and what details SHEG includes or omits. And if nothing else, working to clean up the (in this case quite sloppy) attribution details helps teachers keep their own historical research and thinking skills sharp! This week is a busy one for a variety of reasons, but part of that busy-ness involves missing school on a day before the first test I’m giving in my AP European History classes. While much of the review activity is material my substitute can help cover, I have planned a discussion about how to approach and pre-write Free Response Questions that will be hard to do in my absence. Given these circumstances, I thought I’d revive a tactic I’d used previously in case of absence: making a tutorial video! I find these types of videos, where I’m focused on explaining a skill or intellectual strategy, to be more compelling to make (though perhaps not to view…you’ll all have to be the judges of that) than ones that focus on conveying content. I make that assertion largely based on the fact that I’ve only ever been compelled to make “flipped”-style tutorial videos for skills like these and not for content-heavy lectures. Given that AP European History has a variety of skill sets, writing strategies, and essay approaches that are unique to the exam, I think this genre of video might be one that I’ll continue working on (though given the changes coming to the exam next year, that effort might be in vain). I’ve posted my video below and would welcome any feedback! If I find more energy and time to continue adding to this series, I’ll pass them along here (and thereby avoid having this blog turn into a 1990s-Angelfire-esque wasteland of disused internet). As I’ve written about before, (many-a-time, in fact. See: this, this, and this), I believe that really gaining a clear understanding of historical concepts, events, sequence, themes, etc. comes from actively reshaping the information in some manner. History lends itself well to this because it forces one to think chronologically (timelines), comparatively (comparison charts or Venn diagrams, for those who like to write in tiny oblong spaces), or thematically (color coding major categories). 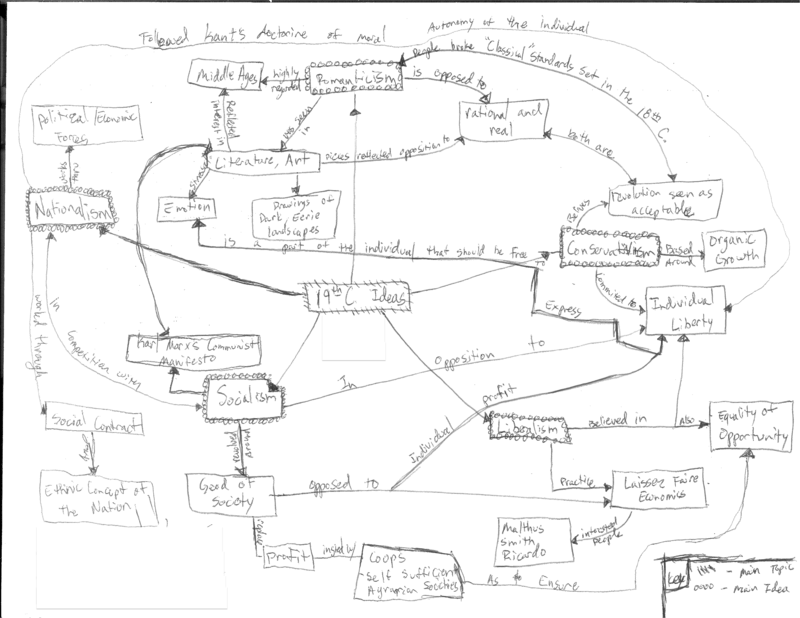 Personally, I’m a big fan of mind mapping, as the process of putting down terms, events, places, etc. and then linking them up and figuring out why they’re important can be a really effective way to understand the material in terms that resonate personally. Moreover, this approach doesn’t require a set formula, end result, or appearance; instead, it can go wherever a student wants to take it. And perhaps most importantly, it helps students understand that history isn’t a memorization challenge – one simply cannot do the analytical work necessary of a historian (or anything that requires critical thinking, for that matter) if rote memory is the lone approach to understanding the material. I’ve redacted both my name and the grade, but I’ll let you all know that it was quite well received. Reorganize information → breaking from pure memorization. Articulate and understand connections between key terms in your own words. Identify the dominant themes and patterns in the material we’re studying. Start with a list of ID terms and pick any one of them to begin and put it on your sheet of notebook paper. Add other terms (one at a time) that connect to that initial term and link them with arrows. **On the lines of the arrow EXPLAIN the connection between these terms by writing a description of that link ON THE LINE. ** ← This is the most important part of mind mapping and is vital in terms of accomplishing the above goals. OPTIONAL – you can add colors/highlighting to indicate major categories of information (e.g. Social, Political, Religious, Intellectual, Technological, Economic). These are (as with all things posted here) a continual work in progress, so if anyone has suggestions about how they introduce this concept or present other ways of getting students to meaningfully reorganize information, I’d be thrilled to hear about those in the comments.